There are a lot of emotions involved when buying your first house: excitement, terror, anxiety, wonder, relief, panic, etc. However, for me, the predominant feeling was euphoria. My husband may call it just plain crazy, but I was on cloud 9. You see, we moved in when I had just 4 weeks to go til my due date and I finally had a nursery! Let the nesting commence!!! For months I had been hoarding baby stuff and collecting nursery ideas with absolutely no outlet for the nesting instinct that had been building and building and building! So when we crossed that threshold (yes, my hubby carried me across, big bump and all) the only room I was interested in was baby's. Of course, after buying the house we had very little $ left for decorating...ok, no $ left. So my creative and resourceful nature took over. We had received so many gracious gifts and second hand goodies that I started there. I knew I wanted color! 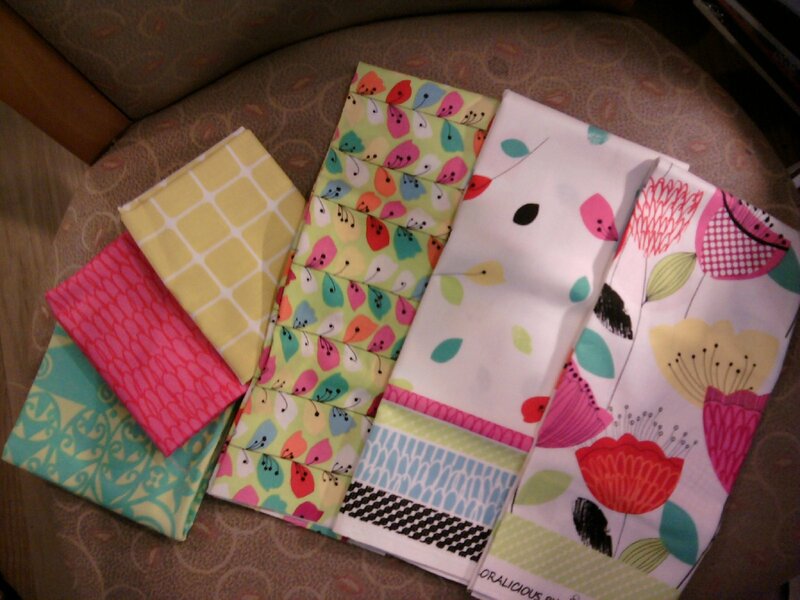 So when a good friend offered to make a quilt in fabrics of my choosing, I went with a bright and cheery, floral fabric collection that stood out and had lots of options for coordinating colors elsewhere in the room. I also bought fabric myself to make the crib bedding and various projects. From there, I decided I wanted white furniture to create a bright and clean look. My inspiration came from here. A can of white gloss interior paint had been left in the garage from when the previous owners recently painted the trim and crown molding. So I sanded down an old dresser we already had and the vintage looking crib we received from my sis-in-law and painted them glossy white. I liked the look of the dresser white (it had been a dark brown and black) but wanted to liven it up a bit. I would have loved to find some glass/acrylic, Anthropologie style drawer knobs, but those get pretty spendy. So I painted some of the knobs with aqua acrylic paint I had and glued rounds of my fabric onto other knobs to create a fun and eclectic dresser. Next up, was the crib. It got the same treatment as the dresser and turned out great. Then I used my new, very first sewing machine (bday present from my fabulous hubby) to get started on my christening project, the crib bedding. I took measurements and made my own pattern for the crib skirt and bumpers and got to work. That was a learning experience! All turned out well, but I definitely took note for future sewing projects when allowing for extra inches for hemming. Duh! With the skirt and bumpers in place and my friend's beautiful quilt, the crib was a success. The closet was a very important aspect of this nursery. She wasn't even born yet and already had a TON of stuff. Luckily, it already had a shelving system in place that made for a perfect gallery o' baby clothes! I added some Dollar Store baskets for pretty, easy-access storage, hung all her colorful and adorable clothes up on those oh-so-cute tiny hangers, and in no time she had a closet fit for the princess she was. My mother-in-law refurbished an amazing glider and ottoman for us that matched perfectly and is one of my absolute favorite pieces in the room. It is just as comfy as it is pretty. Placed in the corner by the closet, it fits just right. My grandmother, Grandy, had given me an uber adorable baby doll crib that I was worried wouldn't fit into such a small space (the room is 9X13). But I found a snug spot by the crib that it fit just right into and has made a perfect display for her stuffed animals, dolls and rocking chair until she's old enough to really enjoy them. Putting a changing pad, trinkets and a baby photo of Daddy on the dresser made it a space saver as a changing table too. The cherry blossom canvas turn picture holder went up above the dresser/changing table. The ornate mirror and half-moon shelf went up next to that with more baby shower trinkets and a baby pic of Mommy. I used the MASSIVE volume of tissue paper (what is about baby showers and seas of tissue paper?) from gifts to make paper flower poms that I tacked up on the wall as pretty, 3D art pieces. I made a bunting banner out of fabric scraps and hung it above the closet to bring some color to the massive and boring white doors. We hung a chandelier I bought on sale from Urbanoutfitters.com to replace the simple, builder's standard light fixture and add some sparkle and whimsy. A Walmart rug added a cozy touch and helped a lot with the echo of a small room with laminate flooring. Some spray adhesive and gift wrap from the Dollar Store was used as drawer liner and to add color behind the shelves in the closet. And my favorite DIY moment came when I decided I wanted to do the whole "name art" thing that has become a must for any nursery these days. However, I wanted it to be special, different. I thought the simple wooden letters on ribbon looked so blah and ordinary. I wanted something outside of the box for her room, an art piece worthy of displaying my lil princess' name (I know, I know, but I'm a new mom so give me some slack eh?) I found a massive frame at St. Vincent's for $12. I painted it with the same paint I used for the dresser and crib, hot glued $8 worth of Dollar Store plastic flowers to the canvas, frayed the edges of squares made from leftover fabric, and glued the letters on top of the squares. I hung it above the crib with very sturdy hooks (it's really not heavy at all, but I wanted to be extra careful). Her room now has that statement piece, a focal point that really makes the room pop, I think. -Paint the walls, which we didn't do this time since it was so close to my due date and we didn't have the time, $, or idea what color we wanted. The gray walls work just fine for now. -Paint the crib bright yellow and switch it into a toddler bed. -Paint the dresser bright pink. -Make that super cute ruffle bedspread. That's a sewing project if I ever saw one! -Create some eclectic wall art pieces to make a "gallery." -Add a chevron rug. I love this one from UO. *Random materials, such as glue and sand paper, were already in my DIY arsenal. Have a wonderful Easter weekend and happy DIYing!